Weststraat 64, 8370 Blankenberge, Belgium. A delightful seaside retreat. Enjoy a weekend of sun and sea in Blankenberge, a midweek break or a pleasant holiday at the coast. 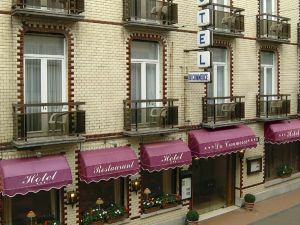 Located in the centre of Blankenberge, the tranquil feel and friendly air of Hotel Du Commerce is just the place to recharge those batteries. Just 4 minutes from the beach and in the center of Blankenberge the hotel is surrounded by many cosy restaurants, outdoor cafés and shops. 28 hotelrooms provide every modern comfort and convenience, bath or shower with toilet, telephone, television, safe, hairdryer and fridge. 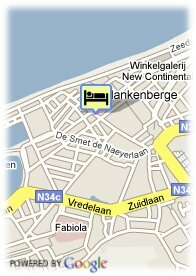 All activities of Blankenberge are within strolling distance of the hotel. Take the air on the beautiful long North Sea beach, amble along the wharves in Blankenberge yacht marina, take in the artistic city of Brugge, the location of Hotel Du Commerce is the ideal place to treat yourself to the best. Internet is available free of charge.There are internetcomputers available in the lobby free of charge. Beach, Near trainstation, Centre, Harbour, Countryside, Near subway / tramstation, Near shopping centre. Less than 14 days and more than 3 day(s) before arrival: 1 night will be charged. Children less than 12 years and more than 4 year(s) old: 15.00 € for each additional bed.